I had several weeks of survey work in various places in Eastern Africa, so I invited my cousin Denver to accompany me as a travel companion. We did work in Kenya and Ethiopia, but unfortunately, a tight work schedule, being in the company and sometimes under the direction of others, and lack of transportation meant I could not find time to go a-confluencing. We did cross the Equator on a north-south road near Kisumu, Kenya, and had a little pseudo confluence ceremony at E 34° 44', but it wasn't the real thing, and I was unsatisfied. At the end of the trip we found time to bounce over to West Africa to see my little sis and her family who are living in Northern Ghana. She has been making funny noises about how many places I've been in the last several years, including one other trip to Africa, without stopping by her place, so I knew I had better show up at her door or suffer the consequences. Saturday morning, 16 Oct 2010, dawned bright and clear. We were debating our sightseeing options when I introduced the idea of looking for a Confluence, and how important it was to world peace to make sure they were all properly inspected, etc., and the idea won the day. We might have been within striking distance of one of the unvisited ones in the country, but the lure of logging a confluence on the Greenwich Meridian was too strong, so off we went in search of 11N 0E. My brother-in-law Jon, my nephews Carter (8) and Sterling (5), Denver, and myself made up the expeditionary force. A small amount of time with a map gave us the general direction, and Jon was pretty sure he knew roads into the area, so we headed out. 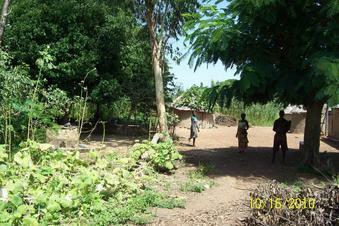 The area consists of slightly rolling terrain with traditional mud huts/compounds surrounded by their fields. Roads and vehicle tracks meander through the area, but only mota (motorcycle) tracks or footpaths lead to most compounds. We followed our nose, including driving along some mota tracks, until we were within 1/2 mile or so of the Confluence. We came to a creek that we were uncertain about crossing, so thought it would be a good place to start walking, and choosing a path leading mostly north, we struck out across the fields of corn, millet, and vegetables. We passed close by a number of compounds, and having Jon as interpreter was invaluable. The culture demands that everyone be greeted, and Jon had the lingo to do it correctly. Sooner or later everyone wondered why we were coming through, and Jon replied that we were "roaming". He explained to us that that meant we were not coming specifically to see them. He also assured everyone that we were not coming to bring bad news, which seems to be the assumed reason a foreigner would venture out into the wilds. We had numerous invitations to take food with them, ("next time", Jon would say) and even the offer of the gift of a chicken, which he was somehow able to evade. And then we were there! The Confluence landed at the edge of an un-walled compound, so I found the spot, and took my photos. Only three people were around, a mother and two teen aged children. The son wanted to know what we were doing, and Jon informed him that the map showed this place, and so we had to come to it (as if we had no choice). They gave us a small tour, and we bid our goodbyes. As we arrived at the pickup a number of children, probably about 12 in number and from 8-12 years old, were there energetically washing it with water from the creek. We greeted them and then began to climb in. At the last minute Jon handed one of the oldest children one cedis (worth about 70 US-cents), and boy, did they celebrate. The whole pack was leaping, hollering, and waving their arms in the air. The smiles were as big as I have ever seen. As we drove away we decided that since we were so close to the border, a crossing was in order, so we continued to follow the GPS map and crossed the border at the lowest key crossing I have seen in my life. Shortly after this we met a man, who confirmed that we were in Togo, so we turned around, and headed home for lunch, satisfied that world peace was one step closer to reality! The borderline with Togo is running about 3-4 km east, SE, and south of the Confluence.